I’ve seen so many stores close over the years like Toys R’ Us and Blockbuster Video, but nothing hit more close to home than the death of Ben’s Best Kosher Deli in Rego Park. I’ve seen so many Kosher delis die over the years, but it usually would happen when the demographics of a neighborhood would change (i.e., Grabstein’s in Canarsie, and Joe’s South Shore Deli in Georgetown, Brooklyn), but Ben’s Best closing hit hard because it was one of the better Kosher Delis and it was around for 70+ years. Thanks to my friend, Joe Rashbaum, who helped me remember the place, I was able to talk to the owner Jay Parker over the years. Jay was one of the few deli owners who could deal with a changing demographic and he was able to build a customer that would come far and wide. Jay was the businessman who told me that demographics is just an excuse when a business closes. Jay was doing well until the City of New York took away half the car spaces on Queens Boulevard to make way for a bike lane that no one uses because Queens isn’t Manhattan. Jay decided to throw in the towel, so the Deli closed June 30th. What hurts most about Ben’s Best closing is that kosher delis are a dying business everywhere. New York City once housed 1,500 Kosher delis and we’re probably down to about 20 (including delis that aren’t kosher like Katz’s on the Lower East Side, which does have the best pastrami). What has been killing the kosher deli? First off, it’s the food. Thanks to what we know about heart disease and cholesterol, pastrami, corned beef, and hot dogs aren’t exactly health food. So a changing appetite of the restaurant eating public has hurt. Thanks to the cost of kosher meat, you can’t go without spending at least $17 a sandwich (which is what I paid at Ben’s Best last week). I also think that one thing that most people don’t mention about the death of kosher delis is that the people who eat kosher won’t go to a kosher deli that isn’t Glatt Kosher. Ben’s Best like most kosher delis aren’t Glatt which would increase their food costs and would force them to close on Saturday and all religious holidays. When I asked Jay about going Glatt, he told me that the costs of closing on those days were greater than the traffic he’d bring in from the Orthodox crowd. Plus Orthodox families are large and they don’t have the budget to eat out at a kosher deli. Ben’s Best unlike the other delis I would visit as a kid (Grabstein’s, Sid & George, Adelman’s, Joe’s South Shore, Deli King, are a few) didn’t have the crowd and customer base that Ben’s Best did. 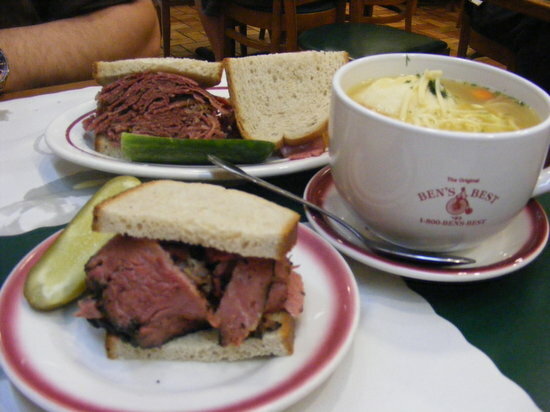 Ben’s Best didn’t have the greatest pastrami (that is still Katz’s) and didn’t have the greatest French fries (Deli King in New Hyde Park did before it became Shake Shack), but it represented the best of the independently owned Kosher deli in New York City. Sure we still have the Second Avenue Deli and I have Lido Kosher Deli by me in Lido Beach and there are still a few Ben’s (not to be confused with Ben’s Best) out there, it feels like a piece of Jewish history in New York is gone and it won’t be the last Kosher deli to go.